SEMINOLE, FLORIDA, UNITED STATES, April 8, 2019 /EINPresswire.com/ -- Estala Skin Care just added a new product in its beauty accessories collection. Estala Skin Care has been known for its pharmaceutical grade skin care line and now starting to make a buzz for selling top quality beauty accessories online. The most famous Holywood Vanity Mirror is one of their best seller, as well as their UV LED Nail Dryer Lamp. 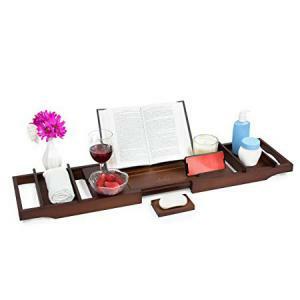 This April, this amazing skin care and accessories company launch its newest accessory which is another addition to their collection of top-quality product -- the LUXURY BAMBOO BATH CADDY TRAY. It is fully adjustable and fits with nearly any tub size. You will not have to deal with wet books & ruined electronics as it has a non-slip bottom allowing you to experience ultimate relaxation in your bath. As part of Estala Skin Care's mission to make everyone feel great and look their best, no matter what, their top-notch beauty accessories including the luxury bamboo bath caddy tray are affordable and simple to use to bring a sense of ease while having a long soak at home and a perfect way to treat yourself some "ME" time. 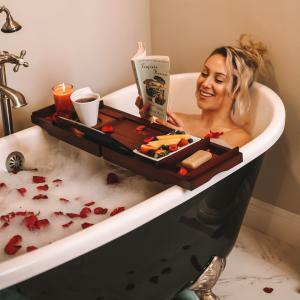 The luxury bamboo bath caddy tray comes with a 1-year warranty, of either a replacement or a full refund, in the unlikely case that it does not perform as advertised.